Gum was a big deal when I was a kid. I remember lots of TV commercials for competing brands. We were always excited when a new flavor came out. That always got us to try a different brand. Hubba Bubba was my favorite. Soft and juicy. My favorite thing to do was blow a double-bubble (that’s one inside of another). I hear the cool kids now get their gum in the modern “tape” format. Also, it’s survey time! If you have a few moments please fill out this survey. The survey will help me possibly get some new advertisers. Thanks! Atleast he dosn`t have to worry about getting gum in his hair. Hubba Bubba! My, God. It’s been years since I thought of that stuff. For the ten minutes the flavour lasted it was fantastic. I always had trouble finding ways to get rid of the stuff afterwards, being always in polite society. Now I know what to do with it: stick it to Biff. I actually tried making my own gum one time, and I managed to defy physics or something, because I got it to stick to TEFLON. Yeah, the stuff that doesn’t stick to anything. Although the end result after drying and cooling ended up more like marshmallow. Pretty tasty. Tape gum? How behind the times. We use Blu-Ray gum now. if Biff needs something to chew then he should just get some beef jerky, unless that causes more problems than it solves. stick your tongue through the wad of gum, and out your mouth. Blow gently into the pocket this creates. Be certain to do so before all the flavor and sugar are gone, though. Certain types are more readilly bubbled than others-they’re specially formulated. Once you get more advanced at this, you can eventually learn how to “crack” your gum. Man, when I was in Little League, the best thing was Big League Chew. Tasted pretty good too. I could never blow bubbles, but I liked Hubba Bubba for the flavouring. I could make it last longer with a mouthful of cold water. I always liked the big pieces better than the tape. My favourite was the Sour Blueberry flavour. @DTanza: He’ll get it in his eyebrows. Bazooka Joe. Comics, and bubble gum? at the same time!? Bazooka Joe was the best gum for blowing bubbles i have ever had. @ sam – i used to buy that stuff 20 dollars at a time. 5 cents each ROCKED. Umm Creations week because he cant invent bubblegum but he can create it. Ahhh am I right am I right you can’t create gum. I thought the image was broken. Cause everything else looked proper! Biff’s anti-gravity eyebrows work well under the strain of home-made bubble gum! Aww, his eyebrows are all droopy and sad. Biff needz to invent something to get him out of this sticky situation….He could blow a total body bubble! 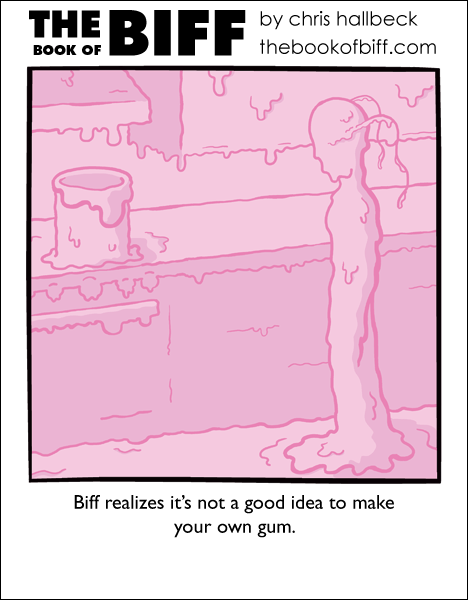 Biff realizes it’s not a good idea FOR HIM to make his own gum. @Linzleh: Trust me, when you’re in this kind of situation, there’s nothing for it but to break out the flamethrower. Not the flamethrower! The liquid nitrogen. Gum loses its sticky when it’s frozen solid. Gum can be a nightmare at my school. Nice one, Biff…now you just need to get your hearing fixed after you clean up. I think they should make and sell toy chewing gum factories. They have toy ice cream makers that make honest-to-god ice cream, and E-Z bake ovens that make real (but small) cakes. Make-Your-Own-Gum toys would be awesome.